Have you seen "A Christmas Story"? Of course you have. 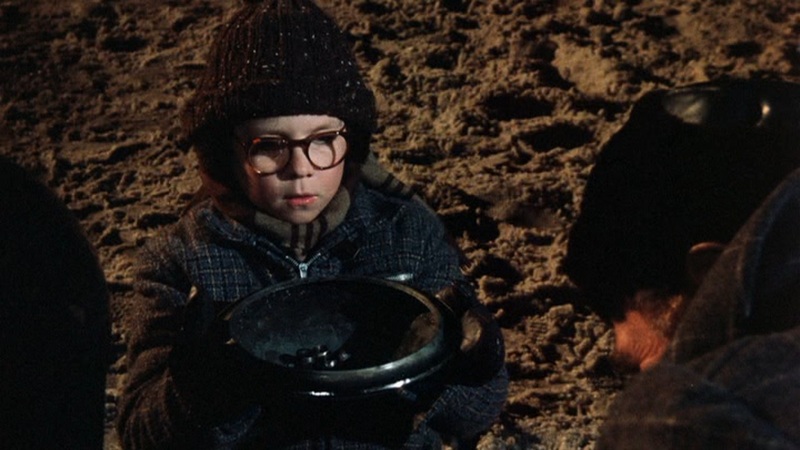 So you'll no doubt remember the scene where our hero, young Ralphie, gets to help his dad change a tire for the first time. Ralphie does his best to assist, but things do not go quite as they should. As the hubcap with the lugnuts goes flying into the dark knight, Ralphie reacts by exclaiming "Oh...Fudge" in slo-mo. Okay, so we end up learning that he really said "THE word. The big one. The queen mother of dirty words. The 'F---' word!" But this was a family film and this is a family blog. So, we'll stick with "Fudge." You see, I had my own "Oh...Fudge..." moment this week. Perhaps you can help me get this thing fudgin' figured out. As regular readers know, part of my work this year involves working with a kickass group of teachers to develop some assessments for our educational technology standards. I've written before about how the targets are squishy to measure---how creative is creative enough? what does it mean to organize one's ideas? But we are actually figuring this part out. A lot of our time and energy has been devoted to taking existing assessments for social studies and building in the ed tech components. Teachers are already using these assessments with students. The student tasks and supporting documents are built. Instructional components are not provided in any depth (based on the assumption that social studies teachers already know how to teach those topics). This is perfect for us, because so many of our targets are centered around thinking and process skills: how to find information, how to determine if that information is valid, how to document its origin, etc. It's not a problem for us if a 3rd grader ends up handwriting a couple of paragraphs about the social studies topic at the end. The product isn't our focus. We have some beautiful supporting documents written. I am most anxious to have them available for public feedback in a month or so. I have been working through the drafts one. more. time. in an effort to incorporate all of the current suggestions and make sure we are ready for prime time. In short, I have been Ralphie with the lugnuts in hand. Now, not so much---the hubcap has flown from my tenuous grasp. use teh Googles. For my group, however, this doesn't work. We need student evidence in order to do rangefinding, select exemplars, etc. What should we have teachers send us? I really don't want to do some sort of fill-in worksheet where the student lists a URL, cites needed bibliographic information, summarizes info, and then provides an explanation why the source is valid. In a perfect world, I would love to do some filming in a few classrooms of the lesson presentation, kids working, and then interviews with students about their thinking and choices. But I will have to find a happy medium between these extremes. How do we secure evidence of thinking---all the metacognitive stuff that happens along the way to the final product? Update: I'm wondering about using Zoho Notebook as a possibility. Anybody using this with students? Concerns about login (requires email) or "cloud" issues? I was all excited about Google Notebook, until I found out the bastages discontinued it in 2009. I seem to be getting fudged over by Google a lot recently. I'm on the road (again) this week. Mind you, it is nothing like last year when I was out of town for six weeks in a row. In fact, my former colleagues just headed to Cincinnati a couple of days ago, much as I did last year. Once I finish this current venture, my calendar is blissfully dull. Lots of work to do, but it can be done in the usual places and hours. This year, I get to enjoy my lilacs, peonies, honeysuckle, and other pleasures of home. Wherever I roam these days, I try to take advantage of the opportunity to meet edubloggers. I have a couple from Stories from School on my assessment committee and enjoy seeing them on a regular basis. I've met Washington teacher-bloggers Jim, Ryan, and Hedgetoad in previous outings. I know Science for All from previous work (and miss running in the same circles as he). I was finally able to have some "face time" with "Mrs. Lipstick" and Jenny last November. I met Athena (who is now MIA) on a trip to Texas a few years ago. I get to chat with Hugh now and then. I briefly saw Joe in San Antonio last month. And, at ScienceOnline 2010, I met dozens of bloggers (including Washington's DigitalBio)---not necessarily of the edu variety, but important to me in other ways. If I get permission to go to ISTE in Denver in June, I hope to be part of edubloggercon and put a lot more faces with names. Edubloggers are a unique breed. It's been good to see them in different places and times...and I hope to meet many more. It's easy in today's digital world to forget that there are real people behind these blogs. Many are teachers are on the front lines, some have administrative or policy perspective, others are students, parents, or community stakeholders. While there is no doubt that every voice is important, we have to remember that what we're really wanting to say is that every person is important. Each time I get to meet and learn from other bloggers in person, it reinforces that message for me. It is also a wonderful opportunity to gain a deeper understanding of that person and his or her perspective. A blog is only a small piece of the whole. Last night, I finally got to meet Dr. Pezz (and Mrs. Pezz, who lurks here; and a friend of the family). They graciously agreed to take some time away from their home improvement projects to share a frosty beverage and swap some stories. Good people, passionate about education, doing what they can to make their schools a good place. Does this old lady's heart good to know the kids are in good hands here.